An Individual Retirement Account is a retirement plan, or in proper explanation, an investment accumulation for retirement which gives account holders tax incentives. Amongst the many types of IRA account, Traditional IRA and Roth IRA are the most popularly used. Investments for IRA normally includes stocks, bonds, shares, securities and other fund vessels. Generally only cash and cash equivalents are allowed to fund an IRA and transferring other assets into your IRA is strictly prohibited. However, in the year 1997, by the Taxpayer Relief Act, adding precious metals like gold, silver, and platinum is made possible. 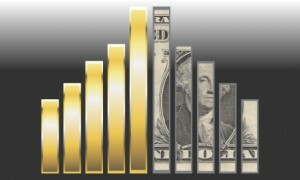 Gold IRA investment gives individuals a way to diversify their funds. That is because when the stock prices drop the price of gold rises. In this way you can still secure a great portfolio even when the stock market is failing. Only gold bars and coins with a purity of 24 karat are permitted into an IRA. Hallmarking of gold should only be done by refiners or assayers that are duly approved by COMEX or NYMEX. At the time being gold coins such as the American Gold Eagle, Perth Mint Lunar Series and Kangaroo Nuggets of Australia, the Gold Maple Leaf of Canada, and the Philharmonics Coins of Austria. Roth IRA has been the choice of many because of tax free growth and tax free withdrawals. Almost all individuals working for a living, those who receive wages, salaries, bonuses, tips, and professional fees, are allowed to contribute to a Roth IRA account. There will be limits set for specific individuals when it comes to income. If your modified adjusted gross income exceeds the limit then you are not permitted to contribute to Roth. If you are eligible, the steps on how to open a Roth IRA account are quite easy especially with the help of the internet. You can check for online brokerage firms and discount brokers on the web. These firms allow you to do everything via the world wide web without even having to mail in anything. There are many IRA companies online where you can find the best IRA rates. Some of which are Scottrade, TradeKing, and OptionHouse. These companies have been branded the leaders in IRA’s when it comes to customer service, trade, offers, and prices. Lets take a brief overview on why this is so. Scottrade – Scottrade offers their account holders a no annual fee and no inactivity fee policy. With their excellent service to customers and incredible value, this company maintained an outstanding reputation for over 25 years in business and is branded No. 1 in the stock brokerage industry. Open your Gold IRA with Scottrade today. OptionHouse – An awardee of Barron’s Survey in 2009 and was voted #1 in stock options trading and trade experience. This firm has no inactivity fees, no maintenance fees, no minimum deposits, and no additional charges with trades that are assisted by their brokers. Open an IRA at OptionsHouse today and get 100 free trades and up to $125 in transfer fees. TradeKing – This online broker has been rated 4 stars in Barron’s 12th Annual Survey of Best Browser-Based Online Broker. Tradeking provides speedy trade transactions, retirement education, exceptional customer service, and a community that is very healthy for investors. They specialize in options trading, mutual fund investments, retirement accounts and stock investments. Open an IRA with TradeKing. Retiree investing is a very practical approach to securing a good life after retirement. So as to say that IRA’s provides tax incentives to account holders and in that way you can save up money faster than you do with regular savings accounts.